Christmas is literally less than a week away and holiday parties are coming and going. 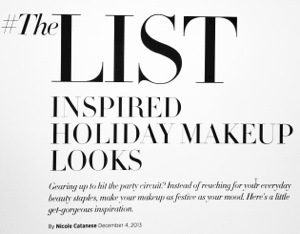 In my search for the perfect festive look I stumbled across a great article on Harper’s Bazaar for the Top Ten Holiday Makeup Ideas. Prepared by Nicole Catanese, I must say that this post is top notch and great to look at right before the weekend to get some makeup ideas for all your parties you’ll be at! When I discovered this list it inspired me to try some new looks, glitter, red lips and even maybe turquoise liner! These looks aren’t just perfect for the holidays they are great for New Years, birthdays and any types of celebrations!